SANDYTOES is a dramatic and charming seaside Nantucket Barn-style home on six levels, nestled into the woods overlooking Cape Cod Bay (the ocean.) Its multiple levels and interesting spaces give it a Swiss-Family-Robinson tree house feeling. Situated on an oceanfront high sandy bluff and abutting 15 acres of forested conservation land (the beach is a short, paved walk down the hill), SandyToes is a UNIQUE and very rare destination. THE ROOMS: The great room is an inviting space at the top of the 'barn.' Under its vaulted, barnwood ceiling with beams and loft, you'll find planked floors, inviting well-appointed kitchen (SubZero, Meile convection oven, large sit-around butcher block island, two Bosch dishwashers, granite counter tops, induction cookers, and more). A freestanding fireplace makes the great room a cozy place to curl up with some of the scores of books. Above the kitchen is a ocean-view loft where youngsters (or grown-up kids) love to bunk or look down at the grownups making lunch with fresh seafood from the nearby fish market. The Great Room's dining deck offers shady sanctuary under its cathedral of trees and has room has a top-quality gas grill. There are 3 pleasant bedrooms on the bedroom level: a garden view room w antique pine double bed / an ocean view room w queen pine canopy bed / an ocean view room w king size pillow top bed w antique headboard and small antique soaking tub. The rooms have beautiful wood floors, antiques, books, and comfortable beds. 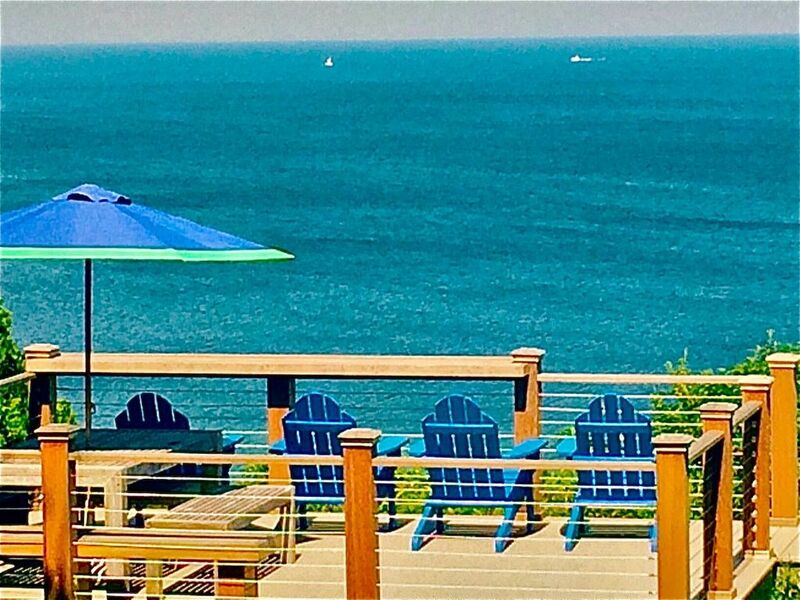 When you step outside through French doors and stroll a few feet up the short sandy path to the bluff to the seaside observation deck, you experience a vast panoramic view of Cape Cod Bay from the highest spot on the bay. At yet another deck, tucked into a private woodsy corner, you can shower outside by moonlight surrounded by forest. This charming 'upside down' barn has elegant touches, but is casual for family fun and entertaining. There are walking paths along the old Indian trail on the oceanside bluff which start right at the SandyToes' side garden. Swim, wade, or beachcomb for starfish, sand dollars, and hermit crabs on a white, smooth sandy beach. In the inter-tidal zone, you can sometimes find blue mussels and sea clams for dinner. The water gets warmer as summer progresses, so September and October are surprisingly good times to visit. We've been told that from our deck you can see when the bluefish come to shore in case you would like to try surf casting. (Yes, we did have a guest who actually brought in a bluefish from our beach.) Across the water, you can see Provincetown & Truro, or watch ships on their way to the nearby Cape Cod Canal, along which there is a fabulous seven-mile level bike path and easy parking for your car. If you ever want to leave, Plymouth Rock, the Mayflower, and the fascinating Plimoth Plantation (which is like a trip in a time machine) are only eight miles north, and Cape Cod proper is a short two miles away. Charming Sandwich is also two miles away and has a Glass Museum and Heritage Plantation and a fine antiques auction on alternate Saturdays. Note: In all our years of renting this 6-level oceanfront home, only one person, was shocked that "SandyToes" does not sit right down on the sand like a Tahiti grass-hut, though we say it is "On a bluff overlooking the ocean," and "Highest Spot on Cape Cod Bay," and beach access is a "short paved walk down the hill." Our 70' bluff is on Sagamore Beach Conservation Land so naturally we can't build beach stairs or otherwise develop conservation land. SandyToes has a super location: You never find an oceanfront home abutting conservation forest. Just how amazing is that? And it is just 2 miles north of the Cape Cod Canal, so you are very close to everything without getting stuck in the frustratingly bad Cape Cod traffic. We sit right on the Sagamore Beach/Plymouth town line tucked into the woods at the ocean. It was a hidden treasure, and I feel so lucky to have found it! The house reminds me of the Swiss Family Robinson tree house. It's all these different levels, interesting spaces and perspectives, the privacy of having conservation forest on the back side but the jaw-dropping expanse of ocean next to it. Sits on a very slowly eroding bluff, so we don't go onto the bluff, but it's easy to walk down the hill to the beach opening. You can see the entire curve of the beach north and also south all the way around the "arm" of the cape which wraps around the CapeCodBay, with Provincetown visible due East/Northeast on a clear day. Vast, panoramic, spectacular ocean view. The sun rises and the moon rises over the ocean directly east - will blow your mind. SandyToes is oceanfront land on a high sandy bluff at the edge of an oceanfront forest. While it is oceanfront, you need to walk down the private neighborhood street, beach entrance at bottom of hill. A smallish, make-do microwave. We are reading that some people think microwaving food is not healthy for humans. What do you think? Digital cable TV, flat screen TV -- but really, you should enjoy the real views from the great room! CD player and MP3 player. But if you are an audiophile, you'll probably have your own portable system with you. Board games... please note, we cannot reassemble every puzzle or check game pieces during turnovers. We will reimburse you if you'd like to buy a fresh (complete) game and add it to our collection. We have a by-now dated DVD collection, but you might find some old gems. Indian Trail along forest side of property, goes into woods along ocean, comes out Sagamore Beach Highlands and trail down to ocean. When east winds are right, paragliders are overhead. This multi-level hilltop home is comprised of many level changes. Although they are connected by short runs of stairs, this can be a challenging house for a mobility-impaired guest. We wish it were not so, but alas, even my mother could not navigate SandyToes. For an excellent, very accessible home just a mile away, please see our beautiful Tamarack Lake Estate which has most features and is easily accessible and at grade. Timberframe in Manomet is another oceanfront listing suitable for our less mobile friends -- as is Carriage House in downtown Plymouth. We wanted to vacation with my mother and sister. Due to Mom's age, we wanted travel to be easy for her, so we began searching New England, keeping it close to her home. Fairly quickly, we found "Sandy Toes." The description was thorough and the photos well done, so we asked Mom and my sister to take a look, cautioning them that in the description it clearly warned of the multi-level layout. Well, Mom was as taken with the property as we were and we set about making plans. Every step of the process was easy, primarily because Robin was easy to work with, and in short order we had our dates secured. On arrival, let me say this home is magnificent, The grounds are beautiful, as is the entry. Once inside each room is eclipsed by the next; decoration and furnishings are perfect. The location is amazing, with views for miles, with the quiet of the forest making it seem as if we really were in our own treehouse. Sandy Toes is just a few miles from Plymouth, so all the town has to offer is an easy drive. Everything needed for daily life -groceries, pharmacy, etc- is minutes away and easy to find. The Sagamore Bridge and Cape Cod Canal are also just minutes away. Long story short, we could not have asked for more. This is a great place, well worth it on every level. Do yourself a favor, take a good look at this home. I'll wager you'll love Sandy Toes. Beautiful home, incredible views, high-end furnishings and beddings you never get in rentals. Every pot,pan,dish,appliance,utensil,glass,you could ever need. Books and games and huge number of towels and all kinds of beach chairs, umbrellas and beach toys. Robin is friendly and responsive. We really loved this unique ocean view property. With the forest on one side and the ocean on the other there was ample privacy. The many levels with lots of windows looking out on the trees made you feel like you were staying in a treehouse. The path down to the beach was just a short walk away. Wonderful place for a big family or several small families. We had such a great week at Sandy Toes! This magical treehouse on Cape Cod Bay is just lovely. We had 8 adults and two youngsters and it was truly perfection. Robyn was wonderful to work with. This was her art studio for years before she started sharing it with others. It’s about an hour south of Boston and just outside the normal Cape high traffic spots. Our private beach was gorgeous. There are miles of hiking trails along the cliff overlooking the ocean. We had daily visits from three neighborhood seals. The breezes off the ocean are heaven and the lush protected forest surrounding the house was private and felt like an oasis. It is very well appointed and the chef’s kitchen and large dining table look out at the ocean. Our lobster dinner was one of the best memories I’ve ever had of family, fun and FOOD! It’s not for someone who has issues with stairs as there are 5 levels and 6 counting the loft. We walked off all those calories we ate all week. The cliff views are breathtaking and there are lots of cozy nooks to sit and read. The master bedroom soaking tub is a nice addition to a private suite. The kids loved the window seat/daybed for cartoon and movie watching. The beach access is a quick 3 minute drive to the private neighborhood parking lot. It’s a fairly steep beach access but doable with a cool traction path or wooden steps to the sand. The water was cold, even for July, but the kids found lots of things to do anyway, including building sand castles, creating rock formations, badmitten, frisbee and football tossing and watching for the three seals who visited daily. It truly was a great week at a unique home. We highly suggest it! We had a great visit at this marvelous home -- very comfortable, lots of bathrooms, kitchen huge w/ fabulous farmhouse-style table & great view. Loved drinks/appetizers on the deck!!! Would not be suitable for young children who need supervision or those with mobility issues. We were adults w/ high-school & college-aged kids and it was terrific and we hope to come back soon! We loved our time at Sandy Toes. The layout ensured that each of our three couples had privacy as well as their own bathroom. The kitchen was perfectly appointed for large breakfasts and evening meals. Everyone found something to love. All the details were taken care of. My father was thrilled with the large grill and full propane tank. I'm usually a sheet snob, and I even loved the soft sheets on the bed. The house is conveniently located with easy access to major highways for day trips on the Cape. We highly recommend Sandy Toes! Sandy Toes abuts Sagamore Beach Highlands Conservation acreage at the ocean. This stretch of oceanfront land is high bluffs, with beach entrances dotted here and there along the low areas between bluffs. It is just two miles north of Sandwich, (probably the prettiest town on the Cape.) It is 15 miles south of Plymouth which is not only historic, but has whale watching and Plymouth Plantation the 1600s village of living history (like a trip in a time machine). Many vacationers know that this is an excellent and increasingly preferred location at the top of Cape Cod, as it gives easy access to exploring without the disadvantage of getting mired in the infamous Cape traffic. Just south is Sandwich. Hyannis is 20 minutes away (ferries transport you to Nantucket), as is Falmouth (ferries to Martha's Vineyard) and Wood's Hole. Buzzards Bay, with it's water-slide park and mini-golf and kayak rentals, is only 5 miles away. Less than 2 miles from SandyToes is the CapeCod Canal Bikeway: 8 miles of flat, paved waterfront biking w rest stations w water fountains, bike rental, food and antiques. Golf: The area has many fine golf courses, antique shops, and historic homes -- some of which date to the 1600s and can be toured. And there's nothing quite like being oceanfront when the July 4th fireworks can be viewed across the water --you can see fireworks all around you as Cape Cod towns have displays that are visible right from 'SandyToes' oceanfront deck. Campfires (current rules permitting) and clambakes on the beach complete idyllic summertime memories. If you want a taste of the big city, you can drive or take a train an easy 48 miles into Boston, where there are concerts, plays, shopping, and sites to satisfy all ages and interests. The commuter rail can take your teens into Boston's South Station, just a quick subway ride from the popular Back Bay, interesting and varied boutiques. Or go to Harvard Square in Cambridge, a lively fusion of culture, education, and exciting shops and bookstores. A short drive to New Bedford's whaling museum and Newport's grand mansions make fascinating day trips. SandyToes may be fully booked by the time you read this. If so, please consider our similarly-wonderful alternatives: -- Storybook 'House by the Sea' an incomparable historic house on direct oceanfront, reigning over one of New England's most beautiful views, has beach stairs to a private beach. First payment due by credit card to HomeAway/VRBO. Balance due to homeowner by personal check or other no-fee method of payment. You will receive our friendly 1 page rental agreement. Your Visa/MC card will be put on file to take the place of security deposit, like at a hotel.